Ferrier, J., Marchand, F. and Balayssac, D. (2016). Assessment of Mechanical Allodynia in Rats Using the Electronic Von Frey Test. Bio-protocol 6(18): e1933. DOI: 10.21769/BioProtoc.1933. Ferrier, J., Bayet-Robert, M., Dalmann, R., El Guerrab, A., Aissouni, Y., Graveron-Demilly, D., Chalus, M., Pinguet, J., Eschalier, A., Richard, D., Daulhac, L., Marchand, F. and Balayssac, D. (2015). Cholinergic neurotransmission in the posterior insular cortex is altered in preclinical models of neuropathic pain: key role of muscarinic M2 receptors in donepezil-induced antinociception. J Neurosci 35(50): 16418-16430. Chronic pain is one of the most debilitating conditions, affecting one out of five people worldwide. Preclinical models in rodents represent a valuable tool for the study of pathophysiological mechanisms and the discovery of new analgesic drugs. However, pain evaluation in rodents is rather challenging. Altered response to mechanical or thermal stimuli is commonly used as behavioral outcome to measure pain sensitivity. This protocol introduces a method for assessing static mechanical pain hypersensitivity in rats using an electronic von Frey (VF) test. The electronic VF is an evolution of the manual VF hairs previously described by Kim and Chung (1991). In this previous procedure, 6 calibrated nylon filaments (diameters of 0.13, 0.23, 0.31, 0.48, 0.52, and 0.59 mm, respectively) are perpendicularly applied to the plantar surface of the rat hind paw, to deliver the following defined pressures: 5.89, 9.81, 27.0, 74.4, 124, and 205 mN. Each application has to be repeated several times for each filament to determine the mechanical threshold. Comparatively, the electronic VF is relatively easy-to-use and particularly suited for pharmacological studies with precise time-points. The electronic VF can be used as a behavioural read-out for a wide range of models, including inflammatory and neuropathic pain. The following protocol was originally published in Ferrier et al. (2013), Grégoire et al. (2014) and in Ferrier et al. (2015). Note: The tip doesn’t need to be changed between rats and between sessions as long as it is not damaged or dirty beyond cleaning. Note: To reach a sufficient statistical power, use a minimum of 8 rats per group. Use preferentially Sprague-Dawley male rats, weighing 200 to 400 g (6 to 12 weeks old), since this protocol has only been validated on this strain of rats. However, there are no obvious reasons that this protocol won’t be suitable for others strains of rats. Note: Within one session, the boxes are carefully cleaned with water to remove the odor of the previous animal. At the end of the session, clean the boxes using 70% ethanol. Note: The apparatus consists of an elevated horizontal wire mesh stand (Figure 1). The dimensions of the Plexiglas boxes set on top of the wire grid are 17 x 11 x 13 cm. The boxes are covered with perforated lids. Frosted or opaque separators can be used to diminish interactions between rats. Note: The apparatus consists of a portable force transducer fitted with a plastic tip (Figure 2). When applying a pressure on the tip, the maximal force applied (in grams) is automatically recorded by the electronic device and displayed on the screen. The maximal pressure (cut-off) will be reached when the paw of the animal is lifted by the plastic tip. Between two stimulations (separated by at least 3 min), the force value is set to zero simply by pushing a foot pedal. Local animal ethics/protocol regarding animal housing and handling need to be followed. The electronic VF test measures the animal’s mechanical “pain” hypersensitivity, a parameter which can be influenced by stress/anxiety (Gamaro et al., 1998). Therefore, it is very important to minimize any environmental stimuli (visual or auditory) and allow rats to acclimate to the experimental room, the test and the experimenter. It should be stressed out that experiments need to be performed in a quiet room by a blinded experimenter using the method of equal blocks with randomisation of treatments to avoid any uncontrollable environmental influence that might induce a modification in the behavioural response. If rats have not been subjected to any other test, put their home-cages in the experimental room for at least one hour for a few days before the experiments. Meanwhile, habituate the animals to be gently held for a few seconds to avoid stress related to handling. Rats are transported to the experimental room and stay at least 1 h in their home cages. Then the first batch of rats is placed on the apparatus for 30 min to acclimatize to the test. With our homemade apparatus, up to 6 rats can be tested simultaneously. Bigger batch can be used depending on study design. Place a heavy object on the boxes’ lids to prevent rats from escaping. Clean the boxes with water humidified paper and place the following batch of rats. This procedure is carried out for two days. Similar to Days 1 and 2, rats are transported to the experimental room 1 h before testing. The first batch of rats is placed on the boxes for 15 min. Place a clean plastic tip on the probe and zero the read-out. Apply the tip of the force transducer on the middle of the rat hind paw (footpad center) from below (Figure 3). The testing area may depend on the pain model used. Important step: Increase the pressure gradually (approximately 15 g/sec) and linearly until a clear withdrawal of the paw is observed. Note the pressure value that elicited the reaction. Assess the withdrawal threshold on the rat situated in the adjacent box (there is no need to replace the plastic tip between each animal). Repeat steps B4-7 until each rat has been submitted to the test. Then go back to the first rat and repeat until two close withdrawal thresholds are observed (less than 10% of difference). Stimulations on the same hind paw should be at least 3-5 min apart. Both hind paws can be assessed in the same animal, but in the case of a polyneuropathy (Ferrier et al., 2015), there is no need to test both of them. In the case of mononeuropathy [e.g., spinal nerve injury (Kim and Chung, 1992) or chronic constriction injury (Bennett and Xie, 1988)], the paw withdrawal threshold of the contralateral limb (unaffected) can serve as an intra-animal control. Figure 4. Representative results. Paw withdrawal thresholds were measured using the electronic von Frey test before and after intraperitoneal administration of oxaliplatin (6 mg/kg, dissolved in 5% glucose) or its vehicle at Day 0. 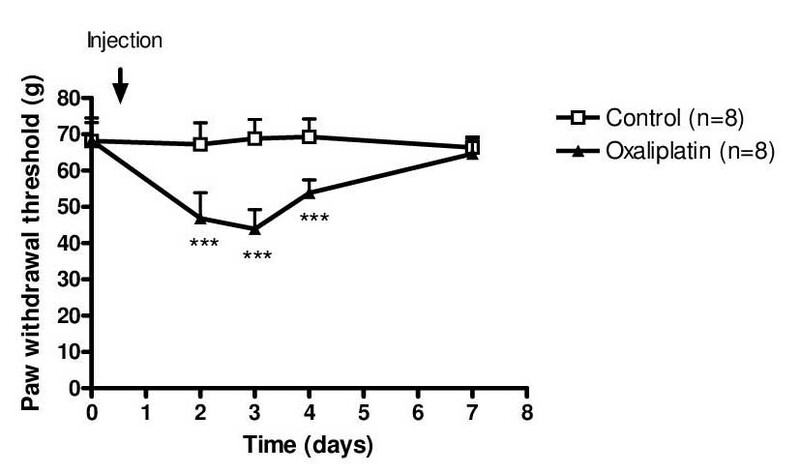 Rats treated with oxaliplatin developed a transient mechanical allodynia from Day 2 to Day 4 after the administration (***P < 0.001 compared to vehicle-treated rats, two-way repeated measure ANOVA followed by a Bonferroni post hoc test) as described in (Ferrier et al., 2013). Data are represented as mean ± standard deviation. The rats have to hold still during the procedure with their entire hind paw on the floor. The measurement should be excluded if the rat has moved during the stimulation. The first value recorded is often excluded from the analysis, as rats may be surprised by the stimulation and reacted before reaching pain thresholds. Therefore, a minimum of 3 measurements are taken for each rat. Both hind paws can be tested per animal. Make sure to apply the tip perpendicularly to the hind paw and with the same speed between rats as it may increase variability of the results. If rats are tested too many times over several weeks, they may become unresponsive to the test or fall asleep in the boxes. Very gently tapping or running a pen along the wire grid before the stimulation (but not during) may help increase attention and improve the results. Healthy rats yield paw withdrawal thresholds between 60 to 80 g. This value may be directly dependent upon the experimenter, especially regarding the speed of which the tip is applied on the hind paw (slowly: low thresholds and quickly: high thresholds). This work was funded by the Ligue Nationale Contre le Cancer comité du Puy de Dome. Bennett, G. J. and Xie, Y. K. (1988). A peripheral mononeuropathy in rat that produces disorders of pain sensation like those seen in man. Pain 33(1): 87-107. 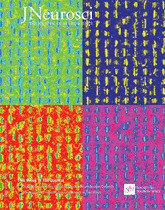 Ferrier, J., Bayet-Robert, M., Pereira, B., Daulhac, L., Eschalier, A., Pezet, D., Moulinoux, J. P. and Balayssac, D. (2013). A polyamine-deficient diet prevents oxaliplatin-induced acute cold and mechanical hypersensitivity in rats. PLoS One 8(10): e77828. Gamaro, G. D., Xavier, M. H., Denardin, J. D., Pilger, J. A., Ely, D. R., Ferreira, M. B. and Dalmaz, C. (1998). The effects of acute and repeated restraint stress on the nociceptive response in rats. Physiol Behav 63(4): 693-697. Gregoire, S., Wattiez, A. S., Etienne, M., Marchand, F. and Ardid, D. (2014). Monoarthritis-induced emotional and cognitive impairments in rats are sensitive to low systemic doses or intra-amygdala injections of morphine. Eur J Pharmacol 735: 1-9. Kim, S. H. and Chung, J. M. (1991). Sympathectomy alleviates mechanical allodynia in an experimental animal model for neuropathy in the rat. Neurosci Lett 134(1): 131-134. Kim, S. H. and Chung, J. M. (1992). An experimental model for peripheral neuropathy produced by segmental spinal nerve ligation in the rat. Pain 50(3): 355-363.